Rosemary Roasted Root Vegetables with Kale is a hearty vegetarian side dish that’s perfect for your holiday gathering. It’s made with beet, carrot, parsnip, butternut squash, red onion and kale, and topped with goat cheese and pumpkin seeds for added taste and texture! Pre-heat oven to 400F and grease a large cast iron pan with 1 tablespoon of oil. Add the beet, carrot, parsnip, squash, onion and top with remaining 2 tablespoons of oil, rosemary, 1/2 teaspoon salt and garlic. Stir until the vegetables are well coated. Roast in oven for 40 minutes, or until the vegetables are cooked to your desired liking. (For softer vegetables, roast a little longer). Be sure to stir the vegetables a few times to ensure they don’t burn. While the vegetables are roasting, add the kale and remaining 1/8 teaspoon of salt to a large bowl and massage the kale until it softens a bit. (This should just take a few minutes). Once vegetables are cooked, remove from oven and add the kale. Stir until combined and let sit for a few minutes until the kale wilts a bit. 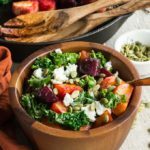 Divide veggies and kale into 4 serving bowls and top with goat cheese and pumpkin seeds. Store any leftovers in an airtight container in the fridge and enjoy within 2-3 days. The butternut squash cooks a little faster than the other vegetables, so I cut the squash into 1.5-inch cubes and the other vegetables into 1-inch cubes.